Konami announced the end of sale and online services for New Little King’s Story for PlayStation Vita on April 20th, 2018. According to their schedule, the game and its downloadable content had already been removed from sale before the announcement, on April 16th. Online services were to be terminated one month later on May 20th, 2018. The game was released to retail in Australia, Europe, and Japan but was a digital exclusive in North America. The announcement provides no explanation, only an apology. It is possible that a publishing deal between Konami and Marvelous Entertainment (MarvelousAQL), the developer and publisher of the original Little King’s Story, had expired. It is also possible that Konami simply chose to stop selling the game to scale back on expenses involved in supporting its online features. “Thank you for the support to Konami Digital Entertainment. We would like to announce the service termination of selling and online service of PlayStation®Vita software 『New Little King’s Story』via PlayStation®Store platform would be start by below schedule. We will make all possible efforts to improve our service and deliver securer entertainment to users. We beg your understanding and sincerely apologize to users of『New Little King’s Story』in here. 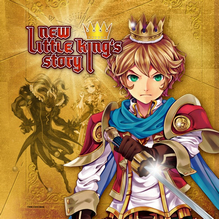 The game’s predecessor, Little King’s Story, remains available on physical media for Nintendo Wii and as a download for PC on Steam. Thanks to Carbon_Lancer for submitting this game to the site.